Covering more than 270 square miles (700 square kilometers) and reaching a thickness of as much as 2,460 feet (750 meters) in places, this vast glacier is Iceland’s fourth largest. It sits atop the active Katla Volcano, which has erupted many times over the centuries, spewing meltwater, rock fragments, and ash into the air. With unstable ice, crevasses, and changeable weather conditions, the Myrdalsjokull Glacier can be dangerous to explore solo. For these reasons, most visitors go as part of an organized guided tour from Vik or Reykjavik. Many glacier experiences take place on Solheimajokull glacier, an easy-to-access section of the larger Myrdalsjokull Glacier. Choose between Super Jeep tours, snowmobiling excursions, guided glacier hikes, and ice climb adventures that take place on the vast ice cap, or quad bike rides around the base of the glacier. Longer tours typically incorporate other south coast attractions, such as Eldhraun lava field, the town of Vik, Skaftafell National Park, the black-sand Reynisfjara beach, and Seljalandsfoss and Skogafoss waterfalls. Avoid venturing onto the Myrdalsjokull Glacier on your own, as conditions can be treacherous. No prior experience is required for most glacier hiking, ice climbing, and snowmobiling tours. Specialist equipment is typically provided on guided tours, though waterproof hiking boots are recommended. Because of the uneven surfaces and difficult to navigate terrain, Myrdalsjokull is difficult for wheelchair users to access. Myrdalsjokull Glacier is located in South Iceland, just west of the town of Vik. The only way to get there is by car or organized tour. Take route 221 leading off from the Ring Road (Route 1). A car park is located at the end of the road. From there, it’s a short hike of approximately 0.6 miles (one kilometer) to the glacier’s edge. 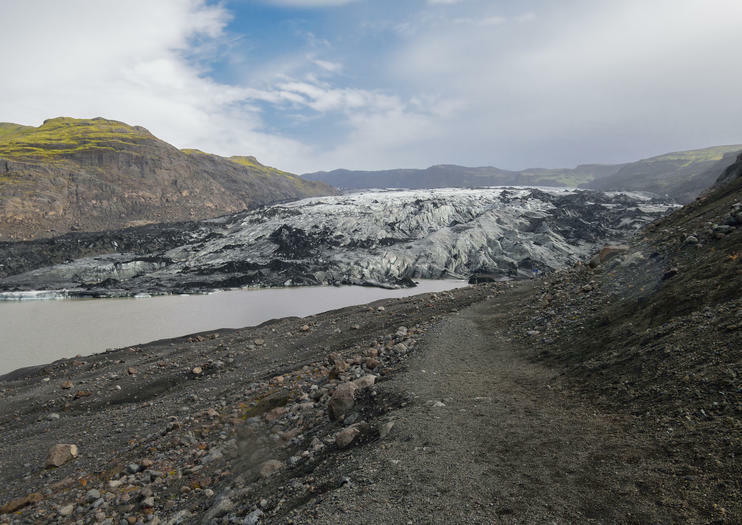 Tours run to Myrdalsjokull Glacier year-round. Snowmobile tours are available throughout the year, while ice cave tours usually take place from October through April. Summer is Iceland’s peak tourist season, but even then, Myrdalsjokull never feels crowded. Try and pick a clear day to visit, as this is when the blue ice and other colors of Myrdalsjokull are most striking. The Land of Fire and Ice is home to many slow-moving glaciers. In fact, some 10 percent of the country is covered by glaciers. Other notable examples include Langjokull, Iceland’s second-largest glacier, and Vatnajokull, Europe’s largest glacier, which sits atop the most active volcano in Iceland, Grimsvotn. Explore the surreal landscape of Iceland's Solheimajökull Glacier during this day trip from Reykjavik. Join your guide for ice hiking and climbing on top of this ancient ice formation, enjoying spectacular views of its constantly changing blend of colors and shapes. Then make a stop at the thundering Skogafoss waterfall, one of the country’s largest waterfalls. Your glacier adventure includes an expert glacier guide, introduction to ice climbing, round-trip transport from Reykjavik as well as all necessary safety gear needed. Home to cascading waterfalls and sweeping black-sand beaches, southern Iceland is a haven of outdoor adventure. On this tour, zoom through south Iceland’s great outdoors by powerful all-terrain buggy with your guide. Take in top attractions including Mýrdalsjökull glacier and Skógafoss waterfall, and experience high-octane thrills in the Icelandic wilderness. Safety kit and round-trip travel from your Reykjavik hotel are included on your tour. Discover the waterfalls, glaciers, and black sand beaches of Iceland’s South Coast on this unforgettable full-day tour. Enjoy a personalized itinerary and the undivided attention of a private guide as you traverse the wild landscapes of the Eyjafjallajökull glacier and explore Vík, Iceland’s southernmost village. That’s not all: learn about Icelandic volcanoes at the LAVA Center, then admire the Seljalandsfoss and Skógarfoss waterfalls, stroll the black sands of Reynisfjara, and get a glimpse of traditional Icelandic life at the Skógar Folk Museum. Southern Iceland is home to frozen glaciers, soaring volcanoes, and cascading waterfalls, but the icy and snowy terrain at altitude makes access a challenge. On this adventurous tour, zoom off-road by powerful snowmobile with your guide and cover the ground with ease. With safety equipment and round-trip travel from your Reykjavik hotel included, reach natural sites of interest including Katla volcano, Mýrdalsjökull glacier, and Skógafoss waterfall. Soar above Iceland's Eyjafjallajökull Glacier and craggy volcanoes on a 2-hour helicopter flight from Reykjavik, and get an aerial view over the country’s rugged landscape. See a steaming geyser from above, fly over the Thórsmörk ridge, then touch down for a walk between looming peaks and ice. Return to civilization along the stark coast, watch waves crash on dark sand beaches and steer above the rolling Blue Mountains that shelter Reykjavik’s southern edge. Get acquainted with the south coast of Iceland during this 11-hour sightseeing tour from Reykjavik. Aboard a comfortable coach with an in-bus audio guide available in 10 languages, travel to some of the south coast's most arresting natural sights. Trek across a portion of a glacier and walk behind a tumbling waterfall. Then, pass the small villages and fertile farmland that make up an area rich in Viking history. Hotel pickup and drop-off in Reykjavik are included. The wild South Coast is home to some of Iceland’s most spectacular natural wonders and this private full-day tour checks off several. In addition to visiting the Seljalandsfoss and Skógarfoss waterfalls, the black beach of Reynisfjara, and the Skógar folk museum, you also get to zip across the Mýrdalsjökull glacier on a 1-hour snowmobile ride. Iceland’s South Coast region is an ideal place to see the country’s natural beauty: black beaches, magical waterfalls, seafront villages, and glaciers. This private tour takes you to see regional highlights while saving you the hassle of driving, and—unlike most group bus outings—lets you control the pace and focus of your trip. Plus, travel in a luxury vehicle and get picked up from your port if you’re arriving by ship. Combine epic scenery with off-road adventure on this private full-day trip to south Iceland from Reykjavik, including a 2-hour quad bike tour. Travel by private vehicle to view the Skógafoss and Seljalandsfoss waterfalls; see the glacier-topped Eyjafjallajökull volcano; and visit museums, lava plains, and more. Plus, join a group quad bike ride that takes you revving you across rivers, and around black sand beaches, lava fields and mountains. Explore Iceland's snow-covered landscape by snowmobile on this tour to the Mýrdalsjökull glacier from Vik. Admire panoramic views of southern Iceland and beautiful sites such as the Seljalandsfoss waterfalls. No previous snowmobiling experience is needed to enjoy this exhilarating experience—all protective equipment is included and you’ll be under the guidance of your instructor at all times. Buckle up your hiking boots for a 5-day version of Iceland’s famous Laugavegur trek from Landmannalaugar. On a 35-mile (56-km) route that takes in lava fields, mountain glaciers, and bubbling hot springs, you’ll trek through some of the county’s most remote wilderness and stay overnight in mountain huts. It’s a treat for adventurous souls and fit trekkers who are aged at least 14 years old. Explore the Thorsmork Valley in a super jeep on this full-day private excursion from Reykjavik. Get views of Iceland's diverse landscape, including waterfalls, volcanoes, and glaciers that make for dramatic photos. This private tour ensures personalized attention and a flexible itinerary. Pickup and drop-off at Reykjavik hotels.